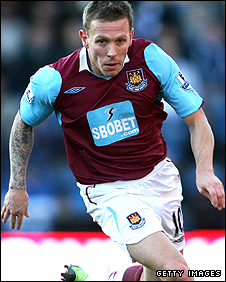 Striker Craig Bellamy has completed his transfer from West Ham to Manchester City for an undisclosed fee. The Wales international, 29, underwent a medical earlier on Monday ahead of joining the eighth club of his career on a four-year contract. He was left out of West Ham's squad for Sunday's 3-1 win over Fulham, having told club officials on Friday that he wanted to leave. West Ham agreed a deal with City on Sunday. The fee is thought to be £14m. Man City boss Mark Hughes, who managed Bellamy at Blackburn and during his time in charge of Wales, said: "I am delighted to be working with Craig once more. "He is an outstanding player who provides us with qualities that we are slightly lacking. "He has blistering pace, has bags of enthusiasm and has a superb attitude to training. He will be a great addition to the squad." John Hartson, a former team-mate, also believes City have made a shrewd purchase. "I know he's moved around a lot and let himself down on occasions, he'd be the first to admit that," Hartson told BBC Radio 5 Live. "But he is very good professional, the first on the training ground and the last off it." Bellamy joined West Ham for £7.5m last season and has previously had spells at Norwich, Coventry, Newcastle, Celtic, Blackburn and Liverpool. Hammers boss Gianfranco Zola told the club's website: "I wish him all the best and I hope he does well and finds what he is looking for. "I am very happy with what he has done for me and now he has decided to go somewhere else. "We wanted to keep him but he wanted a new challenge and we respect that. For our fans, I can say again that we want to achieve a high level so we are looking for players that can help us make that happen." And chief executive Scott Duxbury confirmed that West Ham had ruled out the Welshman moving to London rivals Tottenham. "We refused him permission to talk to Tottenham last week and were determined to keep him despite repeated interest from them and Manchester City. "However, on Friday he again made it clear to the manager and myself that he wanted to move on. "Late on Sunday night, Gianfranco and I met and he said it was in the best interests to accept the player's request to leave and therefore Manchester City's bid." Bellamy, who originally wanted to join Spurs, is expected to make his Man City debut at home to Newcastle on 28 January.